Madonna infamously gargles with salt water everyday (apparently) and despite the fact that she’s probably not relevant anymore, gargling with salt water still is! The main reason to gargle with salt water would be to cure a sore throat but it also helps with nasal congestion, among other benefits. Apparently ginger has “anti-inflammatory properties that may rival non-steroidal anti-inflammatory drugs” and that would be just one of the many reasons as to why I frequently ingest ginger whilst unwell. My favorite healing method? Making (ginger) tea! Instructions: boil water, add crushed ginger (to your liking), add a teaspoon of natural, pure honey, add the juice of half a lemon or lime, add a dash of cinnamon powder, and, lastly, add a sprinkle of cayenne pepper – a flavourful immune booster. Another powerful immune booster, or maybe even the ultimate immune booster, would be garlic; regarded as a natural antibiotic, raw garlic works wonders whilst unwell! Instructions: press or finely cut raw garlic, fill a tablespoon with raw garlic, drizzle coconut oil or virgin olive oil over the raw garlic, ingest (while holding nose if the smell is too pungent for you). Notoriously known as a healing oil for almost every type of ailment, frankincense would be the perfect essential oil to use whilst battling the common cold. I was actually unwell during the beginning of my trip to Europe but constantly applied frankincense to the base of my spine and the soles of my feet as those areas speed up the healing process. However, I did also ingest tons of garlic and gargled with salt water frequently, while occasionally sipping on home-made ginger tea. Known for being an antiseptic, lime would be the perfect essential oil to use when injured. In fact, whilst traveling around Europe I bought new shoes which unfortunately caused giant, bloody blisters but after topically applying the lime essential oil twice a day for three days, the wound had completely healed as a new layer of skin emerged. However, I did combine the lime essential oil with lavender and frankincense essential oil the first two days to speed up the healing process. Unfortunately, I’m prone to allergies so made sure to pack peppermint and lavender essential oil whilst traveling as by combining these oils, you instantly have an antihistamine – either topically apply both oils to the affected area or ingest the oils by adding two drops each into your water but I occasionally do both if the allergy becomes too much of a nuisance. Besides that, peppermint can also be used as a painkiller – the most effective application would be through ingestion so I normally add the oil to my water whenever I experience menstrual cramps. Lavender, on the other hand, can be used to combat jet-lag either by inhaling the oil, ingesting the oil, or applying the oil topically. Of course there are many other essential oils that can be used whilst traveling but which essential oil to pack does depend on your travel location; for example, tea tree essential oil can be used as an insect repellent but if you’re not surrounded by insects during your trip then you might as well pack a more relevant essential oil. 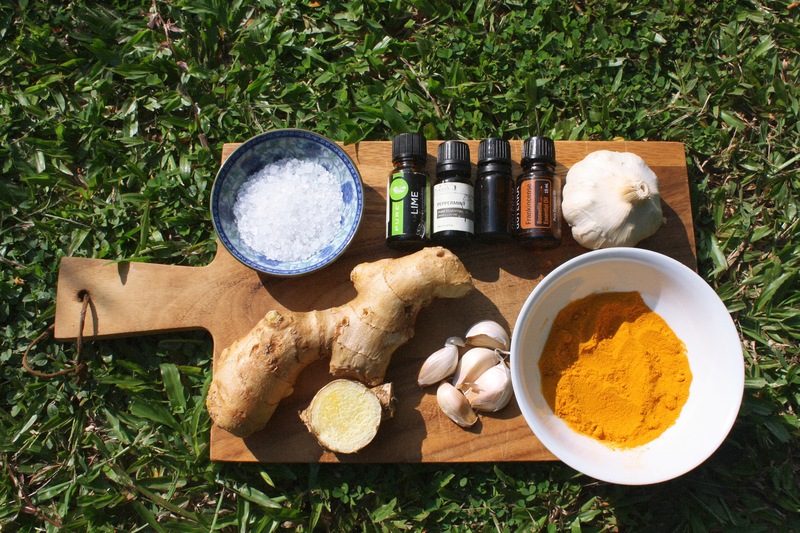 Ancient India thrived on turmeric and even now, the country has an assortment of uses for the plant; from being used in foods to drinks to healing, turmeric would be another miracle cure to integrate into your life for optimal health. I ingest a teaspoon of the powder daily, washed down with water, but my parents prefer to mix the powder with water then drink it. Do note that most turmeric powder sold has added chemicals so find a trusted brand or supplier – if you can’t, a turmeric based supplement should suffice. If you have doubts regarding any of these statements, please conduct your own research as the evidence is a-plenty! Posted in tips and tricksTagged alternative medicine, alternative medicine tips, essential oils, featured, garlic, health tips, holistic healing, holistic medicine, tips and tricksBookmark the permalink.